This year’s edition is titled “Time Has Gone,” a frequently-used Nigerian idiom, which does not perfectly equate to the meaning an Anglo-Saxon reader would give it. The colloquialism refers to anything that is pressing. One would hear it in the bustling Lagosian streets, jumping in one of the infamous yellow cabs, in which passengers constantly berate their drivers, asking them to hurry because ‘‘Time has gone!’’ This phrase incorporates many aspects of what is moving art and citizens these days: a past that we need to accept, a present that constantly calls for immediate action, as well as the critical demand for decision and strategic measures for the future. To approach the theme in a holistic manner, the African Artists’ Foundation invited four women curators to discuss and think collectively around the notion. If the majority of the participating artists are women and the show is women-curated, the curators contribution to women empowerment veers away from theme-based feminist exhibitions. Instead, Eva Barois De Caevel, Charlotte Langhorst, Wunika Mukan and Valentine Umansky, this year’s curators, have tried to generate a fluid female perspective and to highlight the diversity of approaches that the notion of time encompasses, while still reversing the usual demographics of the art world. Runs 27th October to 2nd November. 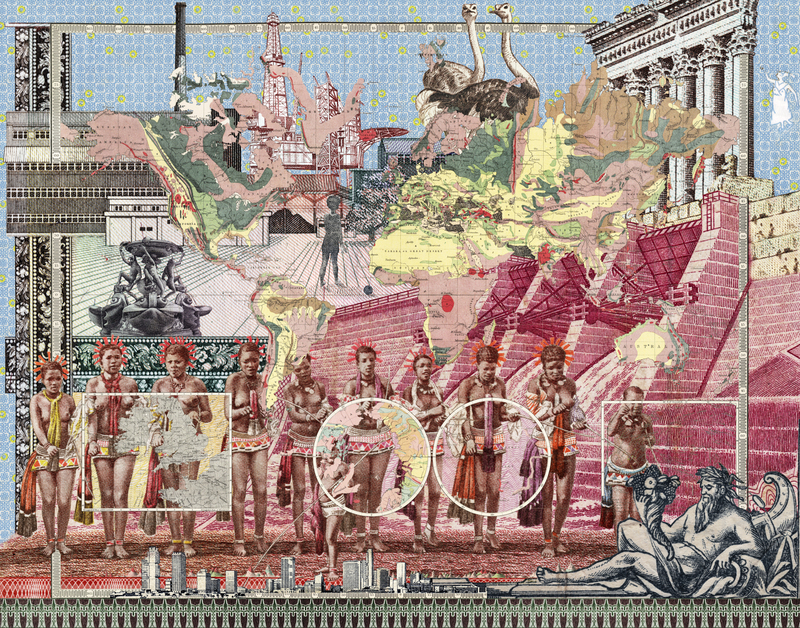 Main Image: Malala Andrialavidrazana Figures 1856, Geological Structure, 2018. Courtesy of 50 Golborne, Alessandro Casciaro, C-Gallery, Dilecta Malala Andrialavidrazana’s Figures series employs the potential of intersecting information and transforming support material. By associating diverse elements such as regional and world atlases or bank notes, Andrialavidrazana’s compositions reframe the knowledge we think we have of the world. Searching for Africa in Life compiles all 2,128 covers of LIFE Magazine published between 1936 and 1996. For the United States, LIFE was the first and most influential all-photographic news magazine. With over thirteen million weekly readers at its peak, its mission was to provide the country with a window into the world. When LIFE’s publisher, Henry Luce, launched the publication, his stated purpose was “To see life; to see the world; to eyewitness great events…” However, the scarcity of covers featuring African subjects throughout the magazine’s sixty-year circulation provides an opportunity to reevaluate this claim. Searching for Africa in Life reflects historical American attitudes about culture andrace – attitudes that continue to reverberate today. Using plain construction paper, Mary Evans’ work is grounded in research on the relationship between contemporary Britain and its imperial past in Africa. Through sculptures and installation, the artist composes narratives based on her experience growing up in England and the difficulty of maintaining her African heritage. Each handcrafted artwork addresses the tenuous relationship between alienation and belonging, and examines how these feelings shape cultural identities. For LagosPhoto, Mary Evans will complete a new fresco on site. The work, titled Passage, a wallscape of cut out, kraft paper figures, evokes a suspension in time and space. It refers to the passage of time as well as a psycho-geographical reference to transitioning from place to place. Many of the tableaux depicted in this, and other installations by the artist, are reminiscent of barely remembered pictorial passages dredged from her memory as a young child in Lagos. With Audre Lorde acting as both subject and surrogate, All That is Left Unsaid is a daughter’s elegy for Michele Pearson Clarke’s mother. Both women lived with cancer for 14 years, and the absence of their wisdom, guidance and love is experienced as an ongoing loss. This short, experimental documentary reflects on all other black women gone too soon, in contemplating this aspect of grief. The interest in expanding the human race onto other planets is not a new concept, but only since the last few decades has the scientific community truly explored the idea that Mars, may be more like Earth than we ever considered. With prototype space suits and diets consisting of freeze-dried food, people from around the globe dedicate weeks to months of their lives simulating the Mars environment to further the study of leaving Earth behind. Simulation sites such as NASA-funded Hawai’i Space Exploration Analog and Simulation (HISEAS), the Mars Desert Research Station (MDRS), and the Human Exploration Research Analog (HERA) create a simulated experience that blurs the line between reality and fantasy; a realm where the air is unbreathable, contact with loved ones is limited, and the dependence and cooperation of your crewmembers becomes center focus.